The National Thermal Power Corporation (ntpc) plans to build a hydropower project on the Gori river in Uttarakhand’s Pithoragarh district. It needs 280 ha forestland for the project of which two-thirds is controlled by the the local forest councils called van panchayats. The elections to one of the van panchayats on January 24 became controversial after villagers accused ntpc of influencing the results. Sarmoli and Jainti villages in Munsiari block have a common van panchayat. The villagers allege district officials rigged its elections because the van panchayat has been spearheading an agitation against the 261 MW project. “The public sector undertaking is using the district officials to silence protests,” alleged former sarpanch of Sarmoli-Jainti van panchayat, Malika Virdi. She was heading the forest council from 2003. Sarmoli villagers said Virdi would have become the sarpanch again in December but for the intervention of the district officials who kept postponing the elections. Outsiders tipped the scale The election on January 24 was the fourth to be held in two months. “The sub-divisional magistrate (SDM) allowed outsiders to cast their votes; many of them did not have identity cards,” alleged Rekha, a villager from Sarmoli. The SDM, Dipti Singh, was not available for comments. Tehsildar C S Bisht said he did not remember what transpired on the election day. “It is over now,” he said. An ntpc official conceded the company had influenced the administration officials. “We cannot offer huge bribes like private builders but we can give good facilities,” he said. 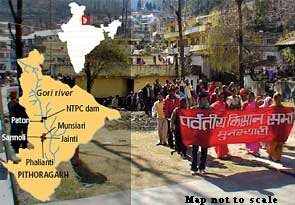 Eight van panchayats have now written to the Union minister of state, Jairam Ramesh, to stop the project. Virdi said she is now getting calls from the tehsil office asking her to submit the account book. She said she would submit the register in the general meeting of the village as is the practice. During her tenure as sarpanch starting 2003, Virdi initiated work on maintaining forests and waterbodies and a project to conserve birds in the Gori basin. For this, the panchayat received Rs 3,00,000 from the non-profit, World Pheasants Association. She also started a home-stay scheme for tourists. The sarpanch of Faliyanti village van panchayat, Balwant Singh, said Virdi is getting threat calls because she had been voicing concerns. He said NTPC agents have been pushed into the forest council now. An activist from Sarmoli village, K Ramnarayan, said people in the area are divided into two groups—those who want to bag NTPC contracts and the project affected. The contractors are also in village development advisory councils (see box), said Ramnarayan.